Wash and trim 250g asparagus and toss in 2 tbsp olive oil. Preheat a griddle or frying pan and cook for 5-8 minutes, turning, until just tender. Serve immediately, drizzled with a little extra virgin olive oil and balsamic vinegar. Scatter over a few shavings of Parmigiano Reggiano and season with freshly ground black pepper. Asparagus is very versatile and can be cooked in many ways. Trimmed bundles should be steamed for 5-6 minutes. Cook no more than one bunch at a time. Place the spears in a large pan of boiling water so they are just submerged, cover and boil for 4-5 minutes or until just tender. Preheat the oven to 220°C, gas mark 7. 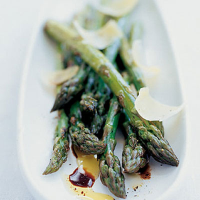 Place the asparagus in a roasting tin and drizzle with a little olive oil. Cook for about 10-12 minutes, turning the spears half way through. The stalks should be just tender when pierced with the tip of a knife. Lightly brush the spears with olive oil and barbecue for 3-6 minutes over a preheated barbecue, with the grill set high or over cooler coals so that the asparagus doesn't cook too quickly. Make turning the spears easier, by threading the asparagus sideways onto 2 skewers. This will enable you to turn the spears at the same time. Use the fine asparagus tips, and stir-fry in a wok with vegetable oil for 1-2 minutes only.